Welcome to the future. 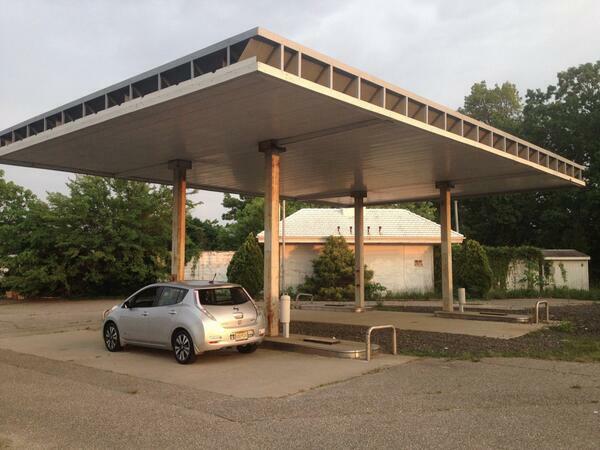 #KickGas pic.twitter.com/ejlLfHdClX— Nissan LEAF (@NissanLEAF) June 12, 2014” class /> Fuelless future? Meet the Electric Car by the Nissan Leaf. Janine and I have recently taken the plunge and bought a Nissan Leaf, a fully electric car and I thought some people might be interested to hear how it is going. We’ve only had it a few weeks so this is an account of our early experience. The Leaf has a maximum range of 160km but a read of the fine print reveals this was achieved in city traffic at an average speed of 20kmh and I bet without lights, heater or air conditioner on. The dealer told us to work on a range of 120km to be safe. We live in Yarragon and our normal day to day trips would be to Warragul, Drouin, Moe, Trafalgar with more occasional trips further afield. So a radius of 60km from our house should easily accommodate these trips and so far that has proven to be the case. Going to Melbourne is out of the question- we take the other car. It is very satisfying to drive along knowing there are no emissions and that our solar system is doing the lion’s share of the recharging; especially so as you drive past petrol stations. The cost to “refuel” is tiny compared to a normal car. We plug it in at home to a 15amp power point in the carport and it takes about 8hrs to fully recharge from empty. It is possible to put the charger on a timer so it happens only on night rate but for convenience and to use the sun directly we just charge it anytime on return from the trip. Driving the car is quite enjoyable. It has amazing acceleration and handles corners really well. It’s comfortable with all the mod cons of modern cars and has an ANCAP rating of 5 stars. Sales are quite disappointing so far but I think as people get to know about them sales will improve especially in the city where I think it should be a no brainer. Public charging infrastructure is very poor but will improve as more cars hit the road. The fast charging stations which can take it to 80% charged in 30min ought only be used once a week to prevent damage to the battery pack. The level 2 charging stations take 2-3 hrs to fully charge a car and as I mentioned the household power point takes 6-8 hrs. We did have a power point converted to a 15amp plug. If you use a normal 10amp point you need to get a small adapter lead to go between the point and the charging lead to the car. Overall I’m convinced we’ve made the right decision but living in a rural area makes having a second petrol driven car essential for longer trips. In a few years time when we need to upgrade that car I anticipate the range of plug in hybrids will be better and we will be able to do almost all driving with electric only power. Read this update on how the Electric Car has affected the power usage.